Lens Description: The 20-50mm f/3.5-5.6 ED II Lens - Black from Samsung is the latest Samsung ultra compact zoom lens for the NX camera systems. Retractable and lightweight, it\'s a great example of the advantage of mirrorless, compact cameras: portable like a point-and-shoot and image quality like a DSLR. With both extra-low dispersion and aspherical elements, this lens goes the extra step to reduce chromatic and spherical aberrations, which means sharp, distortion free images. 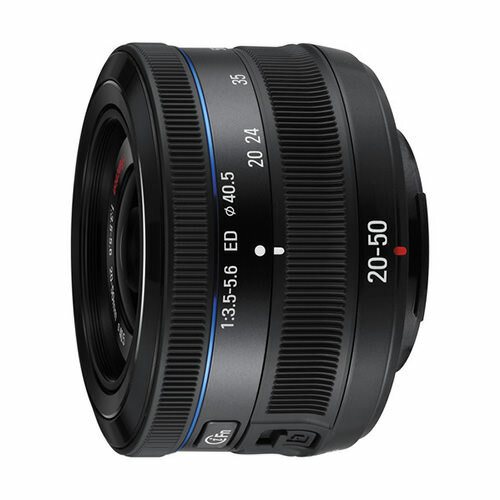 This 20-50mm lens offers the 35mm format equivalency of a 30.8-77mm lens which are the ideal focal lengths for day-to-day shooting, perfect for portraits, sunsets, landscapes and shots of friends and family.